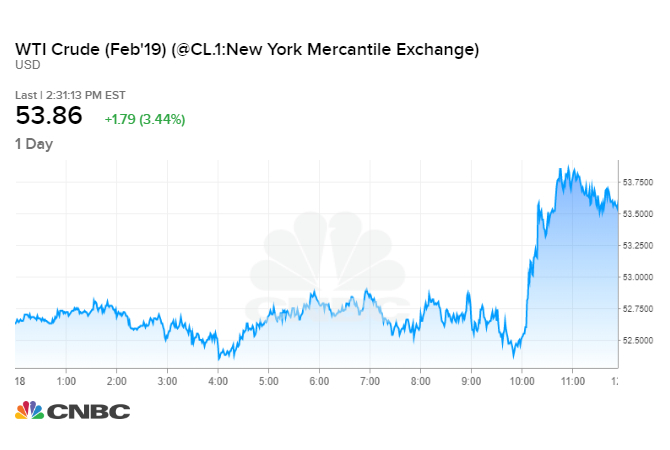 Oil prices hit a roughly two-month high on Friday, rising with the stock market, on news that China has put forward a plan to eliminate its trade surplus with the United States. U.S. West Texas Intermediate crude futures ended Friday’s session up $1.73, or 3.3 percent, at $53.80 per barrel, the best closing price since Nov 21.
International Brent crude oil futures were up $1.50, or 2.5 percent, at $62.68 per barrel around 2:30 p.m. ET. Brent earlier rose as high as $63, its best intraday price since Dec. 7. Both benchmarks are up about 4 percent this week, posting a third consecutive week of gains following a three-month collapse in oil prices. A plan floated by Beijing would see China ramp up purchases of U.S. goods over the next six years with the goal of reducing its trade surplus to zero by 2024. President Donald Trump has highlighted the U.S. trade deficit with foreign countries, and the offer could appeal to the protectionist commander-in-chief. However, U.S. trade negotiators — who aim to address issues like barriers to accessing the Chinese market and China’s alleged theft of intellectual property — are skeptical of Beijing’s offer, according to Bloomberg, which first reported the news. Earlier on Monday, markets got a boost from a Wall Street Journal report that Washington is considering removing tariffs on Chinese goods to calm investors and advance trade talks. Markets gave backs gains after the U.S. Treasury Department and United States Trade Representative denied that either agency has recommended the tactic. The ongoing trade dispute between the world’s two biggest economies has raised concerns about slower global growth and weaker demand for fuel.